از اسباب ارادی زوال ایجاب که از طرف مخاطب ایجاب صورت می­گیرد، رد ایجاب است. رد ایجاب می‌تواند به‌صورت صریح یا ضمنی با افزودن شرایط جدیدی در قبول صورت پذیرد. در رد ایجاب ضمنی، مخاطبی که چنین تلاشی می­کند، خود موجب ایجاب متقابل است. این مخاطب بعداً نمی­تواند ایجاب اصلی را قبول کند. در قراردادهای بازرگانی بین­المللی، متعاملین، جزء­به­جزء و یکایک، شروط هر معامله را بررسی نمی­کنند. بنابراین ناگزیرند برای معاملات خود، فرم­های یکسان تهیه کنند. شروط مندرج در فرم‌های طرفین، شروط ضمن عقد است، مشروط بر اینکه با هم معارض نباشند. در صورت تعارض شروط مندرج در فرم‌های طرفین، نبرد فرم‌ها شکل می­گیرد. نبرد فرم‌ها از مهم‌ترین و کاربردی­ترین مباحث حقوق قراردادهاست که ذیل بحث رد ایجاب مطالعه می­شود. درمورد نبرد فرم‌ها سه نظریه حقوق قراردادها مطرح است: نظریه ارجاع به حقوق داخلی، نظریه اقدام آخر و نظریه تساقط (ناک آوت). فارغ از مطرودبودن نظریه اول، شارحین کنوانسیون بیع بین­المللی کالا با تفسیر ادبی و مضیق از ماده 19، نظریه اقدام آخر و با تفسیر موسع و معتدل از ماده 6، نظریه تساقط را استنباط کرده­اند. علی‌رغم اقبال رویه محاکم و دیوان‌های داوری به نظریه تساقط، به نظر می­رسد که باید نظریه چهارمی تحت عنوان «نظریه بهترین اقدام مبتنی بر کارایی اقتصادی» را در راستای افزایش کارایی، کاهش هزینه­های قراردادی و دادرسی، صرفه­جویی در زمان و نیل به قرارداد کامل، تقویت کرد. Abstract: Rejection of offer is one of the causes that terminates the offer by the will of the offeree. Rejection of offer may be expressed or implied by adding new conditions to acceptance. In the second case, the offeree’s rejection by adding new conditions to acceptence is considered a counter-offer. The said offeree can not accept the main offer subsequently. The large number of transactions have made it impossible for the dealers to study each and every single term or condition stipulated in a contract and dealers need to prepare template forms for all of their own transactions. These terms are often common and are printed behind the form. Such conditions cause problems when the parties to the contract, both are merchants and use the special forms for conclusion of contract. Conditions in the forms of parties are terms of contract, provided they do not conflict with each other. In case of a conflict between the terms in the forms of both sides, the battle of forms occurs. The battle of forms is one of the most important and the most practical topics in the rejection of offer. Authors of contract law express three theories regarding the battle of forms: “doctrine of reference to domestic law”, “last shot doctrine” and the “knock out doctrine”. Apart from the lack of acceptance of the first theory, commentators of CISG with literary and narrow interpretation of article 19 have inferred the last shot doctrine. By moderate and broadly interpretation of article 6, they have inferred the knock out doctrine. Despite the acceptability of judgmental procedure in courts and arbitration tribunals toward the knock out doctrine, we believe that “efficiency-based best-shot rule” must be strengthened, in order to increase efficiency, reduce contractual and litigation costs, saving time and achieving the complete contract. اخلاقی، بهروز و فرهاد امام؛ اصول قراردادهای تجاری بین‌المللی، چاپ سوم (بر اساس ویرایش سال 2010)، شهر دانش، 1393. اشمیتوف، کلایو. ام.؛ حقوق تجارت بین‌الملل، جلد 1، ترجمه: بهروز اخلاقی و همکاران، چاپ دوم، سمت، 1390. آدامز، جان. 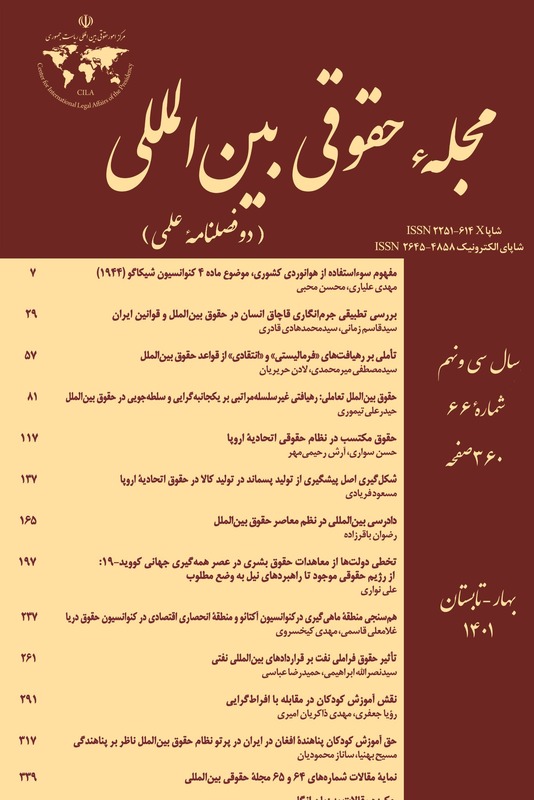 ان و راجر براونزورد؛ تحلیل و نقدی بر حقوق قرارداد در انگلستان، ترجمه: سیدمهدی موسوی، میزان، 1386. بیانکا. سی. ام و ام.جی. بونل؛ تفسیری بر حقوق بیع بین‌المللی، جلد اول، ترجمه: مهراب داراب‌پور، چاپ دوم، گنج دانش، 1391. صفایی، حسین و همکاران؛ حقوق بیع بین‌المللی: بررسی کنوانسیون بیع بین‌المللی 1980 با مطالعه تطبیقی در حقوق ایران، فرانسه، انگلیس و ایالات متحده امریکا، چاپ سوم (با تجدید نظر و اضافات)، انتشارات دانشگاه تهران، 1390. عبدالهیان، امید؛ راهکارهای کاهش هزینه مبادله در انعقاد قرارداد، گزارش پژوهشی در دفتر مطالعات اقتصادی (گروه مطالعات محیط کسب‌و‌کار) مرکز پژوهش‌های مجلس، مرکز پژوهش‌های مجلس، 1393. کوتر، توماس و رابرت یولن؛ حقوق و اقتصاد، ترجمه: یدالله دادگر، انتشارات تربیت مدرس و نور علم، 1388. اسماعیلی، محسن؛ «ایجاب و زوال آن از دیدگاه فقه و حقوق تطبیقی و کنوانسیون بیع بین‌المللی کالا»، مدرس، شماره 9، زمستان 1377. پارساپور، محمدباقر و وحید فقیهی؛ نبرد فرم‌ها در کنوانسیون بیع بین‌المللی کالا با مطالعه در حقوق ایران، پژوهش‌های حقوق تطبیقی، دوره 16، شماره 3، پاییز 1391. شعاریان، ابراهیم و رؤیا شیرین بیگ‌پور؛ «مطالعه تطبیقی نبرد فرم‌ها و آثار آن در انعقاد قرارداد»، مطالعات حقوق تطبیقی، دوره 5، شماره 2، پاییز و زمستان 1393. محقق داماد، مصطفی و محمدهادی دارایی؛ «مطالعه تطبیقی اسباب زوال ایجاب»، تحقیقات حقوقی، ویژه‌نامه شماره 10، 1390. Brousseau, E., Glachant, J. M. (Eds. ), The Economics of Contracts: Theories and Applications, UK: Cambridge University Press, 2004, 2nd Ed. Corbin, A. L., Corbin on Contracts: A Comprehensive Treatise on the Rules of Contract Law, New York: West Publishing Company, 1963, 1st Ed..
Garner, B. A., Black’s Law Dictionary, USA: West Group Pub., 9th Ed., 2009. Honnold, J. O., Uniform Law for International Sales under the 1980 United Nations Convention, The Hague: Kluwer Law International, 3rd Ed., 1999. Murray, J. E., Murray on Contracts, USA: Lexis Pub, 3rd Ed., 1990. Schlechtriem, P., Schwenzer. I., Commentary on the UN Convention on the International Sale of Goods (CISG), NY: Oxford, 2nd (English) Ed., 2005. Treitel, S. G., The Law of Contract, London, Sweet & Maxwell, 11th Ed., 2003. Williston, S., A Treatise on the Law of Contracts, New York, Westlaw, 4th Ed., 1990. Achilles, W. A., “Comment to the Decision of the German Federal Supreme Court of January 9/2002”, BGH Report, 2002. Baird, D. G., Weisberg, R., “Rules, Standards, and the Battle of the Forms: A Reassessment of §2-207”, Virginia Law Review, vol. 68, 1982. Barron, P., Dunfee, T. W., “Two Decades of 2-207: Review, Reflection and Revision”, Clev. St. L. Rev., vol. 25, 1975. Cozzillio, M. J., “The Option Contract: Irrevocable Not Irrejectable”, Cath. U. L. Rev, vol. 39, 1990. DiMatteo, L. A., et al., “The Interpretive Turn in International Sales Law: An Analysis of Fifteen Years of CISG Jurisprudence”, Northwestern Journal of International Law and Business, vol. 34, 2004. Eiselen, S., Bergenthal, S. K., “The Battle of Forms: A Comparative Analysis”, Comp. & Int'l L.J. S. Afr., vol. 39, 2006. Eörsi, G., “A Propos the 1980 Vienna Convention on Contracts for the International Sale of Goods”, American Journal of Comparative Law, vol. 31, 1983. Gabriel, H. D., “The Battle of the Forms: A Comparison of the United Nations Convention for the International Sale of Goods and the Uniform Commercial Code: The Common Law and the Uniform Commercial Code”, The Business Lawyer, vol. 49, 1994. Goldberg, V. P., “The ‘Battle of the Forms’: Fairness, Efficiency, and the Best-Shot Rule”, Oregon Law Review, vol. 76, 1997. Griffee, R., “Explaining Adversarial Boilerplate Language in the Battle of the Forms: Are Consequential Damages in the U.C.C. Gap Fillers a Penalty Default Rule?” J. Bus. Entrepreneurship & L., vol. 4, 2010. Huber, P., “Some Introductory Remarks on the CISG”, in: Rolf, H. (Ed.). Internationales Handelsrecht, vol. 6, Issue 6, Published by Sellier, European Law Publishers, 2006. Kelso, J. C., “The United Nations Convention on Contracts for the International Sale of Goods: Contract Formation and the Battle of Forms”, Columbia Journal of Transnational Law, vol. 21, 1982. Kritzer, A., “Guide to Practical Applications of the United Nations Convention on Contracts for the International Sale of Goods”, Deventer & Boston: Kluwer Law and Taxation Publishers, 1st Edition. 1989. Lookofsky, J., “The 1980 United Nations Convention on Contracts for the International Sale of Goods”, in: Herbots, J., Blanpain, R. (Eds.). International Encyclopedia of Laws – Contracts, Hague, Kluwer Law International, 1st Ed., 2000. Mathews, N., “Circuit Court Erie Errors and the District Court's Dilemma: From Roto-Lith and the Mirror Image Rule to Octagon Gas and Asset Securitization”, Cardozo Law Review, vol. 17, Issue 3, 1996. Moccia, C., “The United Nations Convention on Contracts for the International Sale of Goods and the Battle of Forms”, Fordham Int'l L.J., vol. 13, 1990. Murray, J. E., “An Essay on the Formation of Contracts and Related Matters under the United Nations Convention on Contracts for the International Sale of Goods”, Journal of Law and Commerce, vol. 8, 1988. Piltz, B., “Standard Terms in UN-Contracts of Sale”, Vindobona J. Int'l Com. L. & Arb, vol. 8, 2004. Rühl, G., “The Battle of the Forms: Comparative and Economic Observations”, U. Pa. J. Int'l Econ. L., vol. 24, 2003. Schwenzer, I., Mohs, F., “Old Habits Die Hard: Traditional Contract Formation in a Modern World”, in: Rolf, H. (Ed.). Internationales Handelsrecht, vol. 6, Issue 6, published by Sellier, European Law Publishers, 2006. Shavell, S., Foundation of Economics Analysis of Law, USA: Harvard University Press, 1st Edition, 2004. Vergne, F., “The Battle of the Forms under the 1980 United Nations Convention on Contracts for the International Sale of Goods”, American Journal of Comparative Law, vol. 33, 1985. Viscasillas, M., “Battle of the Forms and the Burden of Proof: An Analysis of BGH 9 January 2002”, Vindobona Journal of International Commercial Law and Arbitration, vol. 6, No. 2, 2002. Viscasillast, M., “Cross-References and Editorial Analysis”, available at http://www.cisg.law.pace.edu/cisg/text/cross/cross-19.html#fn0.html, 1996. Wildner, K., “Art. 19 CISG: The German Approach to the Battle of the Forms in International Contract Law: The Decision of the Federal Supreme Court of Germany of 9 January 2002”, Pace International Law Review, vol. 20, 2008. Winship, P., “Formation of International Sales Contracts under the 1980 Vienna Convention”, International Lawyer, vol. 17, 1983.